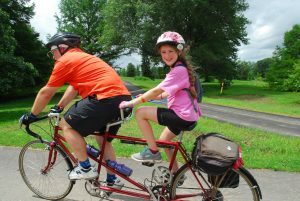 Whether this is your first bicycle tour, your first time with the Great Ohio Bicycle Adventure, or you have ridden GOBA in the past, this information can help you prepare for our weeklong bicycle tour. All bicycle tours handle their logistics a little bit differently. Read the following sections before you register, and if you still have questions, please contact the GOBA office at 614-273-0811 or goba@outdoor-pursuits.org. GOBA researches and lays out all the routes, paints directional arrows on the roads, prints maps and luggage tags, secures campgrounds for primitive tent camping, provides free parking for leaving your vehicle in the starting town all week, pays for security in towns and on the route, provides free showers, portajohns and some inside restrooms in camp, arranges emergency medical services, sets up free bus shuttles around the overnight town, moves your baggage from town to town, provides a souvenir GOBA patch, organizes the nonprofits’ food offerings, pays for evening entertainment, provides GPS-downloadable route maps, publishes newsletters, and a full-color photo scrapbook. Cost of food, beverages and snacks; merchandise (T-shirts, jerseys, etc. ); bringing your vehicle to every overnight camp for the week; massage; repair services; ambulance transport; and entrance fees to attractions (usually at a GOBA discount). Expect additional costs for a car-camper pass, indoor gym floor-sleeping, any lodging other than tenting, optional side trips and some activities. GOBA is a tour and not a race. We hope you will enjoy a leisurely ride in the company of up to 1,500 other cyclists on the same route. Routes are chosen for their scenery, low traffic, road surface, access to food and other services, attractions and distance from overnight town to overnight town (in the range of 45-60 miles per day). A supported shortcut will be offered to reduce the mileage to about 35-40 miles on the longer town-to-town routes when feasible. The official GOBA routes are marked with the GOBA “A” to augment the rider maps provided to you at the beginning of the week. If you do not ride on the official GOBA route or during the stated times for the day, GOBA route services will not be available to you. As on any long distance tour, be prepared for stretches of route where you must deal with heavy vehicle traffic, bad road conditions and bad weather. Through our system for route signage and communications (via amateur radio), we will do our best to communicate route concerns to riders on the route. Please note that we are increasingly experiencing vandalism of our signage and route markings, and thus cannot guarantee a warning in every instance. You should be capable of riding up to about 60 miles per day over varied terrain and in varied weather conditions, as our SAG service on the route is limited to emergencies. Our route maps are not published prior to the tour, but our current year route elevations will be published in advance at goba.com. Before registering, consult your physician about your ability to participate in GOBA. You are expected to leave on the bike routing each day between 6 and 9 a.m. The luggage trucks leave promptly at 8:45 a.m. There will be usually two or three organized food stops on the route, where you may buy food and drink from a local non-profit group, or you may purchase food from groceries or restaurants. In addition, there are sometimes attractions along the way that you may want to visit. You should arrive in the next town by 4 p.m. The times will also be listed in the June newsletter. You are required to ride from town to town at least four days of the week. The other days offer optional loops of 50 or 100 miles and are called “layover days”. On layover days, you have the choice of riding the loops or relaxing or enjoying the sights and activities in the host town. Route details and mileages are approximate and are subject to change. Included in your registration fee is free parking to leave your vehicle behind for the week in the official GOBA campground at the starting town. If you want to bring your vehicle to each of the overnight campgrounds, you may apply for a Car-Camper Pass, at additional cost and with vehicle size restrictions. RVs, campers and other vehicles more than 36 feet in length are not accepted. Please note, in addition to the Car-Camper Pass fee, the driver and passengers must also register for GOBA and pay registration fees. See the Car-Camper information for details. Your registration includes primitive tent camping (which means no electricity or water is provided to individual campsites). 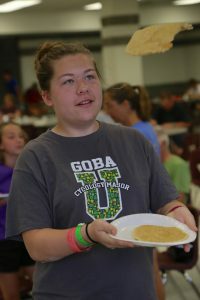 All GOBA participants will be able to tent camp in designated areas only of the GOBA campground (usually a park, fairgrounds, school or college campus). Shade for the tent camping areas is not guaranteed! In the campground, you will find access to portable toilets, inside toilets and restrooms, shower trucks, drinking water, first aid, an information booth and usually food and beverages for purchase. It is against health and fire department regulations to have a fire or cookstove in the GOBA campground. Signs will be posted that will show you where our host facility has determined that no tents are allowed. If you have questions about this while on tour, please inquire at the GOBA information booth. Quiet hours in camp are 9:30 p.m. to 5 a.m.
Take a look at the camp rules, which also will be posted on the info board in camp. Sometimes, but not always, home stays, dorms, or gym floor options are available and, if so, will be published in the GOBA March or May newsletters. If you want a hotel or B&B, you will arrange this on your own, as GOBA does not set up blocks of rooms at the hotels. Instead, if you need assistance, contact area tourism bureaus. See the lodging page. GOBA trucks deliver your luggage to the official campgrounds; you make arrangements for your luggage from there; transport to hotels is not included. The March or May newsletters will contain listings for towns that are offering luggage transport to the hotels. You buy all your own meals, snacks and beverages. As on any vacation, you may seek restaurants and grocery stores. In addition, most days food may also be purchased from non-profit groups on the route as well as in the overnight town. These groups use their proceeds to benefit local schools, churches and other worthy causes. Since these nonprofit meals are served “in the field”, they must adhere to local health department licensing rules and may not offer the full range of food that you would like to see. Thus, you may want to augment your food with purchases from grocery stores and restaurants. Also, please note that special diets for medical conditions cannot be provided. We provide recipes and guidance for vegetarian meals to the local non-profit groups who are preparing meals. This is not, however, a guarantee that vegetarian meals will be available from every food vendor, and selection will be limited. Since you will be purchasing all your meals and snacks, you are free to choose among non-profit groups, restaurants or grocery stores. Be sure to ask at the local info booth in each camp for directions to these options. GOBA registrants will receive a confirmation packet for all registrants in their household. Your rider number and registration are not transferable to another person unless arrangements are made with GOBA. You will also receive: March, May and June newsletters (via email and at goba.com), T-shirt and jersey (if ordered). Directions to the starting town will be in the June newsletter. Your rider packet (with wristband, luggage tags, bike tag, etc.) will be at check-in in the starting town. For more updates, also keep an eye on the rider updates at goba.com and facebook.com/gobatour (you don’t need a Facebook account to view). One information booth, shared by GOBA and the host town, will be set up in every camp. It may be in a large circus-style tent or in a building; a large banner will identify the location. The local host info booth is operated by volunteers from that town and is normally open from 10 a.m. to 9 p.m. on the arrival date, as well as on layover days and 6 to 9 a.m. on the departure day. The local info booth will be able to help you with: bus shuttle schedules, menus, food locations (both non-profits and restaurants), entertainment times and locations, local attractions and activities, floor-sleeping space, shopping options, library, laundromats, movies, layout of the campground. GOBA info is open from 2 to 7 p.m. on the arrival date, as well as on layover days and 6 to 9 a.m. on departure days. When GOBA info is not open, please consult the large information board for news and updates. 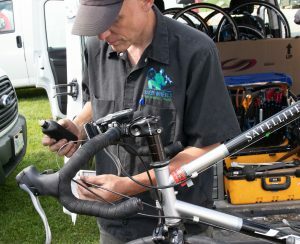 The volunteers here are not from the local town, but they are prepared to help you with: problems with your wristband, luggage tag, bike tag, lost and found, emergency arrangements, weather forecasts, route updates, layout of the campground. If you should need ambulance transportation on the tour, you may need to pay for it. Bring your medical insurance card. GOBA riders can connect with each other (and GOBA) through social media, including in a forum on Facebook at facebook.com/gobatour. Since the views expressed on social media do not necessarily represent the views of GOBA, feel free to contact GOBA directly for clarification of any question. 614-273-0811 or goba@outdoor-pursuits.org. Are you from Ohio? Would you help a GOBA rider from another part of the country? Some riders will be flying in and will need a ride from an airport to the start. Post your ride offer or ride need on facebook.com/gobatour. Or give us your name address, phone and email by emailing goba@outdoor-pursuits.org. Check out “The Way to GOBA” for advice. Participants are responsible for their own equipment, including medical devices. 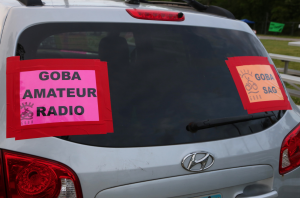 GOBA is not able to provide electrical plug-ins and advises participants to look into battery-powered devices. For medical devices only, GOBA may be able to arrange charging and transporting during the day. See the GOBA first-aid coordinator in camp on the first day. All participants’ non-medical items will be transported in the large luggage trucks. 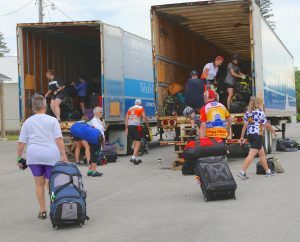 For example, GOBA will not transport participants’ musical instruments or computers in the GOBA medical RV or GOBA supply truck. Please remember that whatever you pack in your luggage and put on the luggage trucks will at some point be on the bottom of a large, heavy pile or will be thrown off the truck during unloading. Do not bring fragile items in your luggage. 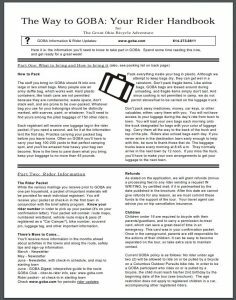 Read “The Way to GOBA” publication for advice concerning what to bring and what to leave home. Alcohol is not permitted in the camping areas of GOBAville. In addition, some of our facilities strictly prohibit the use of alcohol on all parts of their grounds. Non-compliers will be asked to leave the tour. Smoking is not permitted inside public facilities and restaurants in Ohio. Also, some of the local facilities during GOBA week may have their own restrictions that apply throughout their grounds. Please observe all no-smoking signs. 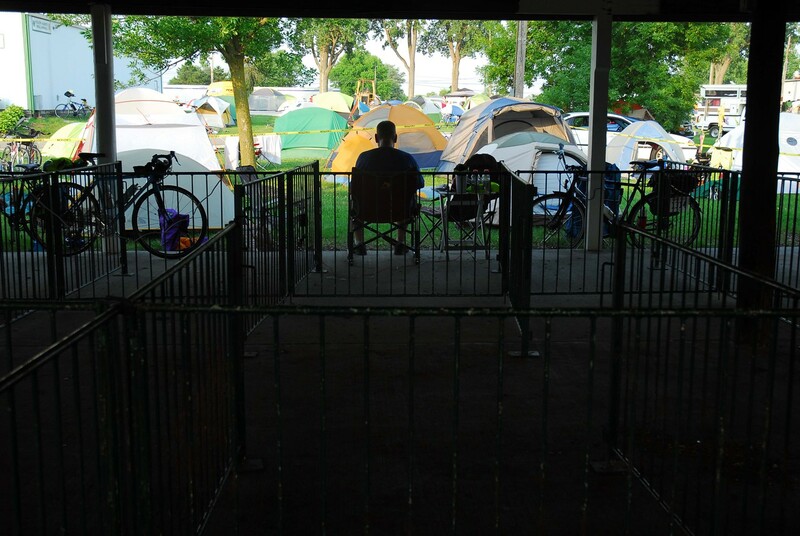 Due to local fire codes and the density of the tents, smoking is prohibited in the GOBA tent camping areas. Since our overnight facilities have restrictions regarding animals on the grounds, we must request that you not bring your pets into GOBA campgrounds. In the March Newsletter, you will find an article with the bike shop listed that will be able to receive your shipped bike and will set it up for you and deliver it to the camp in the starting town. You will need to contact them well ahead of time for fees and services. They may need to receive your bike by at least a week in advance of the tour, due to the work expected for the GOBA weekend. Arrive between noon and 9 p.m. on Saturday, or between 6 and 8:30 a.m. on Sunday. The GOBA campground, parking lot and other facilities do not open to registrants until noon on the first date of GOBA. Following the directions in the June newsletter, park in the “Weeklong Parking” area or the “Car-Camping” area, if you have paid for a Car-Camping Pass. You may put your luggage on the shuttles, which will take luggage from the parking lots to the tent camping areas. You will walk or ride your bike into the main part of the campground, where you will find the “Information Station” in a building. This is where you pick up your rider packet, containing your wristband, Car-Camper Pass if pre-paid, last-minute announcements/reminders, list of food stops and attractions on the route, souvenir GOBA patch, luggage tag, plastic rider number tag to attach to your bicycle. Throughout the afternoon and evening the starting host town will offer activities and food for purchase. You may set up your tent any time after noon on Saturday. Saturday evening will feature the GOBA bicycle parade with costume contest and and free entertainment. Arrive at the starting town no later than 8 a.m. on Sunday in order to pick up your rider packet and put your luggage on the trucks. You will need to start riding no later than 9 a.m. on Sunday, because after that GOBA will be gone.